Three’s Halle Berry on left. Bub’s Reproduction on right. I was lucky enough to be on a tasting tour a while ago and had a cocktail that instantly made it on my top five of all time list. Three in San Mateo makes a Blueberry Jalapeño Cocktail called the Halle Berry, and the owner was kind enough to let me in on the basics. It’s too good to give away the exact recipe, but I’m pretty happy with our first and second attempts. It’s a great excuse to go back and have another at Three, you know, for research purposes. Three uses Skyy vodka, but we had a bottle of Absolut lying around. Neither of us are big vodka drinkers anyway, so there was no great loss if our experiments bombed. Happily, they didn’t. 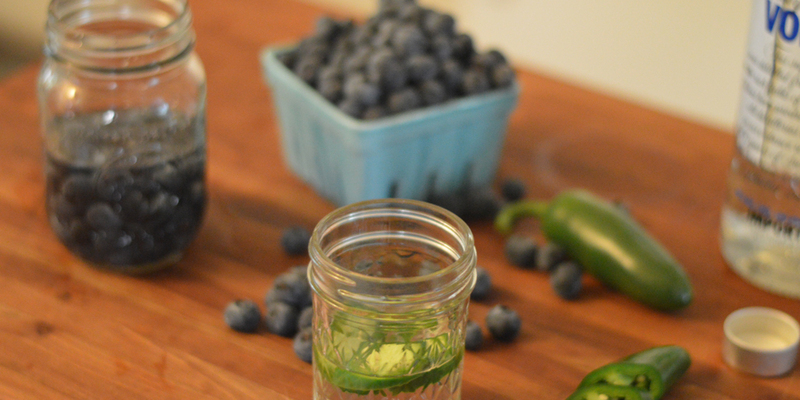 The owner at Three said to infuse vodka with the blueberries for a week and in a different batch infuse sliced and unseeded jalapeños. The blueberries should run for a week and the peppers for only a day. Any longer than that and it’ll be too hot, she said. You might think why not make it as hot as possible and just use less in the final product. I might agree with you, but the taste of the pepper is this case is as important as the heat it provides. We went small batch on the first round. We put just five slices of fresh jalapeño in approximately 6 ounces of vodka. 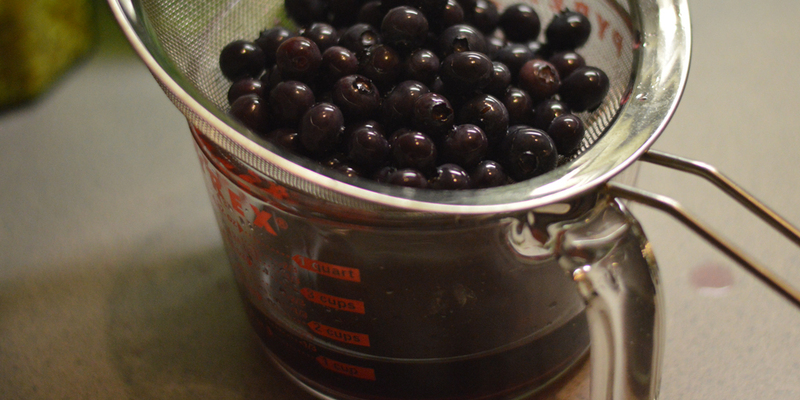 For the blueberries we filled a pint-sized Mason Jar with fresh blueberries and topped it off with vodka. 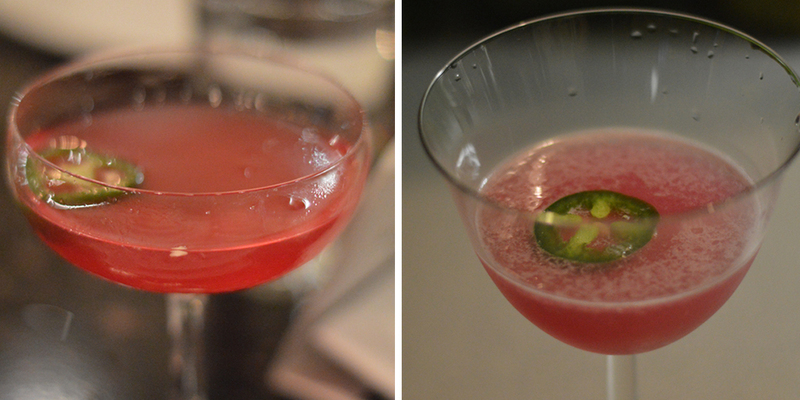 In 24 hours the jalapeño infusion was indeed hot, but not as pepper-tasting as I would have liked. Next go round we’ll probably use more. The blueberries we let go 10 days instead of a week, mostly because we started the infusion on a Wednesday and were waiting for the weekend to test thoroughly, so we thought why not let it run a few more days. I didn’t get exact measurements from the owner at Three. I decided to try equal parts of everything. The resulting cocktail was a little thin, but all the flavors were there. 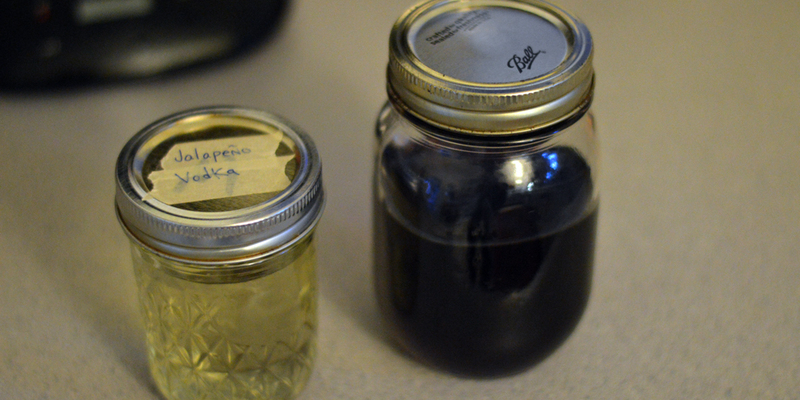 Despite my protestations that the official, non-specific instructions given to me called for no simple syrup, Molly went ahead and made some under the radar earlier in the week, loosely based on a Geeks With Drinks recipe, pulling it out of the fridge for the second attempt. I’d say she put in about a teaspoon, maybe a bit more, and the resultant concoction was almost as good as its inspiration. Next go round we’ll try more peppers in the infusion and (now that we’ve blown through the Absolut) use Skyy, following Three’s lead. It’s a truly dynamite cocktail: sweet, spicy, with the weight and satisfaction of the best Margaritas.